Welcome to yoga with Maureen Mark. Come here regularly to check out the teaching schedule and look for upcoming workshops. Maureen is a dedicated career professional who continually searches for ways to improve the well-being of as many people as possible. Maureen completed her yoga teacher training at Adishesha Yoga Zone and is a certified Yoga Tune Up® instructor. Her training has been supplemented with workshops given by Andrea Peloso, Ramanand Patel, Doug Keller, Basia Going, and Mimi Martel. As a continuous learner, Maureen brings new material into her classes as she learns. Be prepared for blissful ball work, yoga for mobility and stability, and yoga to reduce stress and find peace in our minds and body. And yes, you will learn some anatomy! 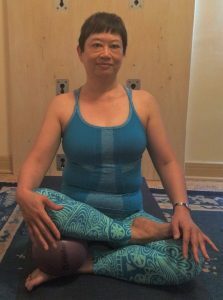 You will find Maureen on the mat at Adi Shesha Yoga Zone (or on the wall), Inner Soul Yoga & Cycle, and Rama Lotus Yoga. Contact me at info@rollonyoga.com if you have questions or want to arrange private classes. I will do my best to reply within 48 hours.